PhD in Physics (Material Science) from Central University, Bilaspur - 2013. M.Phil in Physics from GGDU, Bilaspur – 1994. M.Sc in Physics from GGDU, Bilaspur – 1992. B.Sc in PCM from GGDU, Bilaspur – 1990. L.L.B from GGDU, Bilaspur – 1998. OP Jindal University, Raigarh (C.G), Working as a Professor from October 2016 to till date. OP Jindal University, Raigarh (C.G), Worked as a Sr. Associate Professor from July 2014 to September 2016. 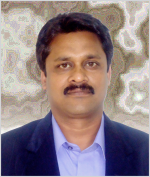 OP Jindal University, Raigarh (C.G), Worked as a Associate Professor from July 2010 to Jun 2014. OP Jindal University, Raigarh (C.G), Worked as a Assistant Professor from July 2008 to Jun 2010. Worked as a Lecturer in KIT, Raigarh from April 2004 to June 2008. Worked as a Assistant Professor in Govt. Science College, Raigarh (C.G), from July 1994 to March 2004. Synthesis of Phosphor materials by Sol gel, Solid State reaction, Combustion, Melting technique. Characterization of Phosphors by Mechano, Lyo, Photo and Thermoluminescence. Girish C Mishra, S.J.Dhoble, R.S.Kher," Study of lyoluminescence of gamma-irradiated GdCa4O(BO3)3:Ce phosphors: mass of solute and pH of solvent as a key factor", Optik (Elsevier),158(2018) 826-830. Girish C Mishra, S.J.Dhoble, R.S.Kher "Lyoluminescence study of gamma-ray irradiated Dy3+ activated CaB4O7 phosphors for dosimetry applications ", International Journal of Current Engineering and Scientific Research(IJCESR), 5(2018) 2394. Girish C Mishra, K.K.Satapathy S.J.Dhoble, R.S.Kher "Urea assisted self combustion synthesis of CaAl2O4:Eu phosphor and its mechanoluminescence characterization", New J. Chem. (RSC), 41(2017) 2193-2197. Girish C Mishra, K.K.Satapathy S.J.Dhoble, R.S.Kher “Mechanoluminescence and thermoluminescence characterization of Tb3+ doped CaAl2O4: a theoretical and experimental study” RSC Adv., 2015, 5, 79391–79396. Girish C Mishra, K.K.Satapathy, R.S.Kher “Preparation Route, characterization and Dose measurement of MAl2O4( M=Ba, Ca, Mg) phosphors activated with Dy3+” Journal of Optoelectronics and Advanced Materials,2015,17,629-633. Girish C Mishra, K.K.Satapathy,F.Khan, “ZnAl2O4:Eu novel phosphor: SEM and Mechanoluminescence characterization synthesized by solution combustion technique”, LUMINESCENCE: The journal of Biological and Chemical Luminescence. Vol.30,no.5, pp. 564-567,2015. Girish C Mishra, K.K.Satapathy,“Hydrazine Assisted Self Combustion Synthesis of CaAl2O4:Eu Phosphor And Its Mechanoluminescence Characterization”, International journal of Sciences: Basic and Applied Research. Vol.16,Issue.1 2014,page 188-196. Girish C Mishra, K.K.Satapathy, F.Khan “BaAl2O4:Dy phosphor: Synthesis and Mechanoluminescence characterization”, International Journal of Engineering Science Invention., Vol. 2, Issue 4 , 2013, page 34-38. Girish C Mishra, K.K.Satapathy, F.Khan “Effect of the fuels on the luminescence characterisation of Tb doped MgAl2O4 phosphors “, Chemical Science Transaction, Vol.2, No.4, 2013, page 1262-1267. Girish C Mishra, K.K.Satapathy, “Dose dependence of Mechanoluminescence properties in MgAl2O4: Dy phosphor”, Journal Of Chemistry , Vol.2013, 2013, page 1-4. Girish C Mishra,A.K.Upadhyay,S.J.Dhoble,R.S.Kher “Effect of Temperature on Lyoluminescence of Gamma Irradiated YCa4O(BO3)3:Ce phosphor, International journal of Innovation and Research , Vol.2, Issue.1, 2013,page 18-21. Girish C Mishra, A.K.Upadhyay, K.K.Satapathy, S.J.Dhoble,R.S.Kher “Thermoluminescence and Mechanoluminescence of gamma-ray-irradiated CaB4O7:Dy phosphors: A comparative study”, International journal of Innovation and Research , Vol.1, Issue.1, 2012,page 63-68. Girish C Mishra, A.K.Upadhyay, S.J.Dhoble, R.S.Kher “Synthesis and luminescence properties of rare earth doped gamma-ray-irradiated GdCa4O(BO3)3 phosphors”, Journal of Material Science,Vol 47,Issue 2,2012,page 898-901. Girish C Mishra,A.K.Upadhyay,S.J.Dhoble,R.S.Kher “Correlation between thermoluminescence and mechanoluminescence of γ-ray-irradiated Dy doped BaB4O7 phosphors”, Journal of Material Science, Vol 47,Issue 6,2012,page 2752-2756. Girish C Mishra, Rajiv Kumar and Arvind Dewangan,“Study of Coulomb dissociation for Nuclear Astrophysics with special reference to the Nucleosynthesis”,International journal of Mathematical Sciences,Technology and Humanities,Vol 14,2011,page 140-146. Girish C Mishra, A.K.Upadhyay, S.J.Dhoble, R.S.Kher,“Thermoluminescence and lyoluminescence in γ-ray-irradiated and Ce3+ doped YCa4O(BO3)3 phosphors”, Journal of Material Science,Vol 46,2012,Issue 26,page 7275-7278. Girish C Mishra, A.K.Upadhyay, S.J.Dhoble, R.S.Kher,“Thermoluminescence and mechanoluminescence of gamma-ray-irradiated SrB4O7:Dy phosphors”, Micro and Nano Letters, Vol 12,2011,Issue 6,page 978-981. “ZnAl2O4:Eu Phosphor:Mechanoluminescence Characterization synthesized by solution combustion Technique” International Conference on Advances in Steel ,Power and Construction Technology , OPJIT,Raigarh-2015(Oral Presentation). “Intellectual Property Rights and Academia:An Appraisal” National Seminar on Managing Resources and Intellectual property rights for research and development in technical education, OPJIT,Raigarh-2014(Oral Presentation). “Dependence of lyoluminescence of gamma ray irradiated GdCa4O(BO3)3:Ce phosphor on pH value of the solvent” National Conferences on Luminescence and Its Application, Rani Durgavati University, Jabalpur, M.P-2014 ( Oral Presentation). “Correlation between Thermoluminescence and Mechanoluminescence of gamma ray irradiated Eu activated MgSO4 phosphors” International Conference on Metallurgical and Materials Processes, Products and Applications , OPJIT,Raigarh-2014(Oral Presentation). “Study of Thermoluminescnce Properties of gamma-ray-irradiated GdCa4O(BO3)3:Dy phosphor” National Conference VIMARSH-13, Chouksey Engineering College, Bilaspur- 2013(Oral presentation). “Thermoluminescence characterization of Ce doped LnCa4O(BO3)3[Ln=Gd,La,Y] Phosphors” National Conferences on Luminescence and Its Application, PESIT, Bengaluru-2013. (Oral Presentation). “Thermoluminescence in Ce doped CaB4O7 and GdCa4O(BO3)3 phosphors:Role of Gd3+ ions” International Conferences on Luminescence and Its Application,RGUKT,Hyderabad-2012. ( Oral Presentation). “Mechanoluminescence of gamma-ray-irradiated MgAl2O4:Dy phosphors” International Conference on Innovation and Research in Technology for Sustainable Development, OPJIT, Raigarh-2012. ( Oral presentation). “Sudies on Lyoluminescenceof γ-ray irradiated rare earth doped LnCa4O(BO3)3 Phophors” National Conference on Recent Trends in Physics of Solids, Govt.V.Y.T.P.G. Auto College, Durg-2011( Oral presentation). Two Week ISTE STTP on Electric Power System, 10th July – 15th July, 2017, IIT Kharagpur. ISTE STTP workshop on CMOS, Mixed Signal and Radio frequency VLSI Design(IIT Kharagpur), 30th January to 4th February 2017. University Gold Medal for 1st position in University merit list in M.Sc. 9th position in University merit list in B.Sc. Indian Society For Particle Accelerators(ISPA). An editorial board member in IJSBAR (ISNN 2307-4531). Member in the board of directors Global Society of Scientific Research and Researchers (GSSRR). Reviewer in IJMSE (ISNN 2315-4527). Reviewer in LUMINESCENCE: The journal of Biological and Chemical Luminescence.